Nicole Miller’s show had just ended and me and these guys were all walking out together to get a cab. I was friendly with them because we saw each other out all the time. I was a little more savvy to the scene, I guess, so I could help them find the good parties. And so we walked out together. I said, “Hey, Liz Tilberis, the editor of Harper’s Bazaar, is having a party down at Indochine. Why don’t you guys come? All the cute models are gonna be there.” They were each just starting to become pretty well-known, but at that point I could still just say, “Come with.” They wanted to meet models and look at pretty girls — what normal guys want to do. And because I knew a lot of the models, I was able to say, “This is so-and-so,” whatever. Not just to Leo, but to any of the young guys who were around. So anyway, we were all leaving, they’re gonna come with me to Indochine. But then we couldn’t get a cab. While we were waiting, I said, “Let me get you three in a picture, come on. Let’s get something a little lively.” Leo says, “How’s this?” And he jumped up. I got a few shots. We go back to waiting for a cab. We’re waiting and waiting, and I see a limo and I said, “Let me try something” — and I hailed a big white limousine. 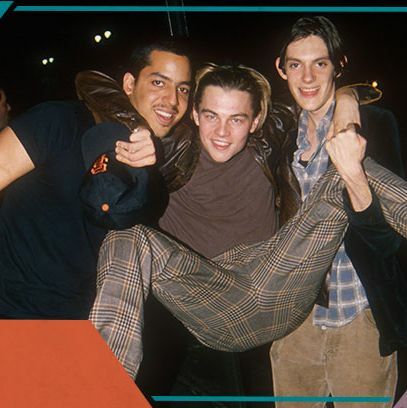 I remember Leo saying [incredulously], “You can do that?” I said, “You can always try.” So it stopped, and for $50 or whatever, the driver took us all to Indochine. I paid for the limo because I think I had more money than any of them at the point. Maybe now he’ll pick me up in a limo some day. That’d be funny. We talked about who was pretty, who was cute. “Did you see the girl in the green dress?” That type of stuff. Then when we got to the party I introduced them to Liz, and of course Liz knew who Leo was. He wasn’t megafamous yet but we all knew him. He had done Gilbert Grape, some good movies. But he hadn’t done Titanic yet. That was a turning point. I saw him a couple of years later in California, asked him for a photo. He was very friendly, very polite. But he said, “No, I don’t do pictures.” He must have had a press agent say, “Don’t let people take your picture” or something, or he was emotionally exhausted from having gotten inundated by people. He’s still a nice guy, but he’s so super-successful. He’s the new Clark Gable, you know? I remember another time he was mad at me because there was this thing in Vegas Magazine. I did an interview and the reporter asked me if there was anybody that I thought was great, whom I didn’t think was great anymore, and I said how Leonardo DiCaprio and Tobey Maguire never want their pictures taken anymore. So then when I ran into Leo after that, he said, “I’m mad at you.” He wasn’t mean; he was half-joking. I said, “What are you talking about?” He said, “You said I never do pictures anymore.” I said, “Well, can I take your picture?” He goes, “No!” He’ll do the red carpet for his movies — but you can’t take his pictures at a party. I want to be clear, though, that Leo was and is very polite. And so were the other guys in that picture. His friends, his group, they were his real friends — they still are his friends. They were all just hanging around together, having fun. Patrick McMullan’s nightlife photography appears weekly in New York magazine and regularly in such publications as Allure, Interview, and Gotham magazines. You can follow him on Twitter.